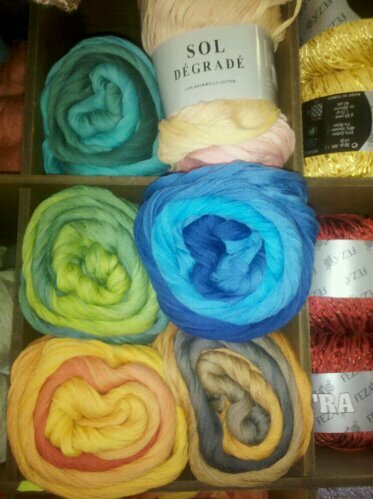 Here are photos of some of the new yarns I wrote about yesterday. 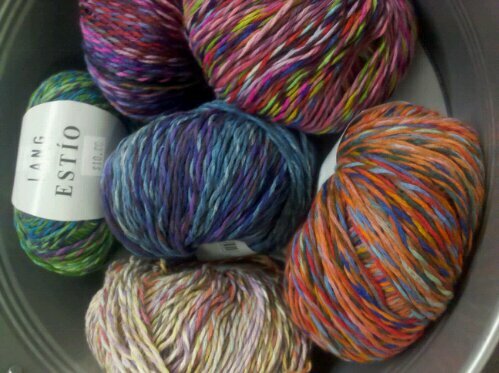 First is Lang’s Estio,a cotton/wool blend that knits up at 4.25 sts. to the inch. The colors are beautiful! There are many patterns in the new book Lang 102. In that same book are patterns for Exotic and Sol Degrade. I am also designing a summer top out of the Sol Degrade(a cotton color stranding ribbon ). What is shown in the picture is 2 balls of yarn! I am at the point where I am doing straight knitting, so I will do 1 more ball worth of yarn. 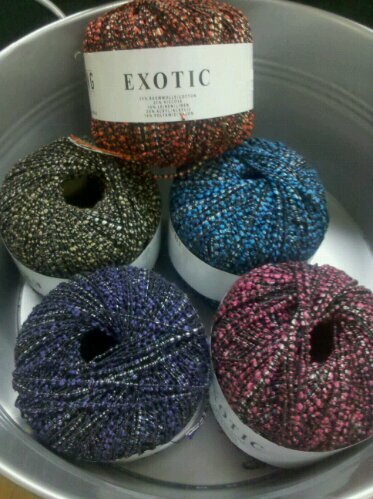 Also just in are some new Classic Elite yarns, but no books yet. I will let you know as soon as the books are in. Sat. is the overnighter! Don’t miss the fun.